No matter how long you’ve been playing fantasy football, there are always some lessons to learn. The game is evolving, and your fantasy strategies should follow suit. As we review the 2018 season and begin to look ahead to 2019, it’s important to keep an open mind. A year after seeing its lowest offensive production in a decade, there was a record 1,286 offensive touchdowns in the NFL during this past year. Let’s examine some lessons I’ve learned and others that I was reminded of during this past season that could prove to be very insightful as we head towards 2019. We already took a look at the quarterback position, now we turn our focus to fantasy backfields. If there was ever a season to remind people how important is to have your star running back’s backup, 2018 was it. No backup proved to be more valuable than James Conner was in Pittsburgh as Le’Veon Bell’s holdout stretched the entire season. Conner finished as the RB6 in PPR leagues despite missing three games down the stretch. It marked the fifth straight year the Steelers had a top-six fantasy producer at the position. As the year went on, other players who started off as the backup running back on their teams became fantasy factors including the likes of Phillip Lindsay, Nick Chubb, Damien Williams, Jamaal Williams, C.J. Anderson, and even Conner’s backup, Jaylen Samuels. Early in the season it might be hard to hold down roster spots with backups, but late in the year after bye weeks start winding down insuring your top fantasy assets, especially at running back, makes a ton of sense. This past year we saw 16 different running backs pull in 50 or more receptions, which ties the mark for the most runners to do that is a season during the Super Bowl Era. Just look at the rookies: During the first 97 years of NFL history, Reggie Bush was the only rookie running back to record 80-plus receptions in a season. Over the past two seasons we’ve seen it happen three times. Alvin Kamara and Christian McCaffrey did it in 2017 and Saquon Barkley accomplished it in 2018. On average, NFL running backs averaged 4.61 targets per game, and if you look at the top 12 fantasy finishers at the position, only three averaged less than five targets per contest. Targets lead to opportunities to score fantasy points. 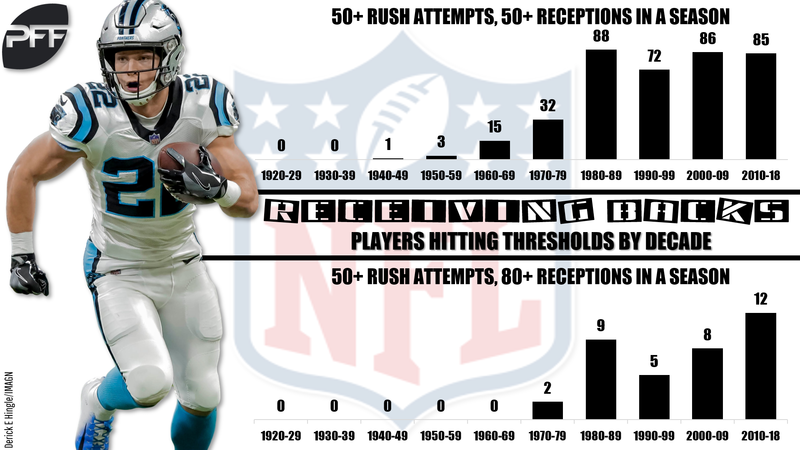 With more targets going to running backs than ever before, the position is becoming even more valuable than it used to be. Barkley was hyped up big time coming into 2018 and boy did he deliver. The Giant became the first rookie to ever finish a year with 100 targets and 200 carries. His 383.8 fantasy points are the most ever by rookie as he became the first rookie to be RB1 in PPR scoring since Eric Dickerson in 1983. Barkley wasn’t the only good story. Lindsay provided solid RB2 fantasy production while becoming the first-ever undrafted rookie at any position to be named to the Pro Bowl. Chubb and Sony Michel also each offered pockets of elite production. However, there were some rookie duds too. Derrius Guice suffered a season-ending injury before the season even started. Royce Freeman had an ADP of 3.06 and finished as RB46. Rashaad Penny and Ronald Jones were mid-round picks, but they combined for just 571 total yards and three touchdowns on 124 touches. Rookie running backs can definitely deliver quickly, but it is far from given. Far too often owners overrate rookies so it’s hard to find value. Tread carefully. The environment in which a player plays in can have a huge impact on a player’s fantasy output, especially at running back. 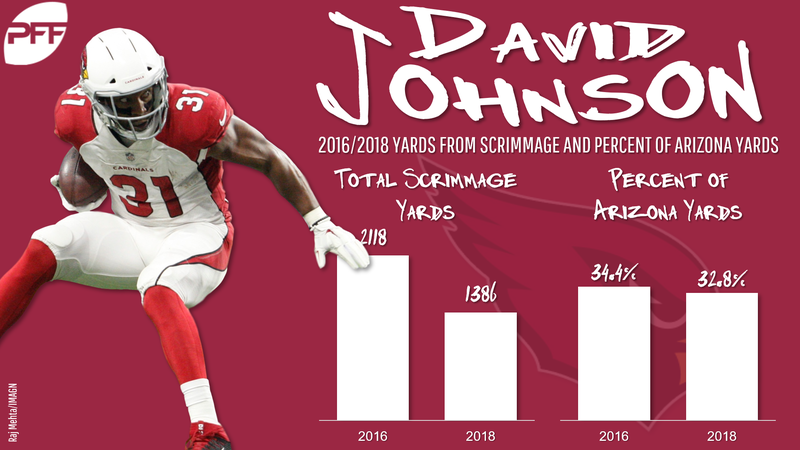 Look no further than what David Johnson did in Arizona this season for a perfect example of this correlation. Johnson, who was drafted as a top-five overall selection in 2018 fantasy drafts, managed to finish as RB9 in PPR leagues mostly on the fact he scored 10 touchdowns. The fact that Josh Rosen boasted a 67.9% adjusted completion percentage, which ranked in the bottom three among qualified passers; the wide receiving corps was one of the worst in the league; and the offensive line didn’t have a single player exceed a PFF grade of 66; all proved to be too much for Johnson to overcome even with his elite skill set to deliver a good return on investment. Only 16 running backs played 50% or more of their team’s offensive snaps last season compared to 25 players reaching that mark a decade earlier in 2009. Back then six running backs broke the 300-carry mark; in 2018, only Ezekiel Elliott managed that feat. With more running backs getting touches, but fewer bell-cow running backs available, fantasy owners are finding success targeting players that have big-play ability. Barkley not only finished atop the position in PPR scoring, but he also bolstered a league-leading 54.0 breakaway percentage. 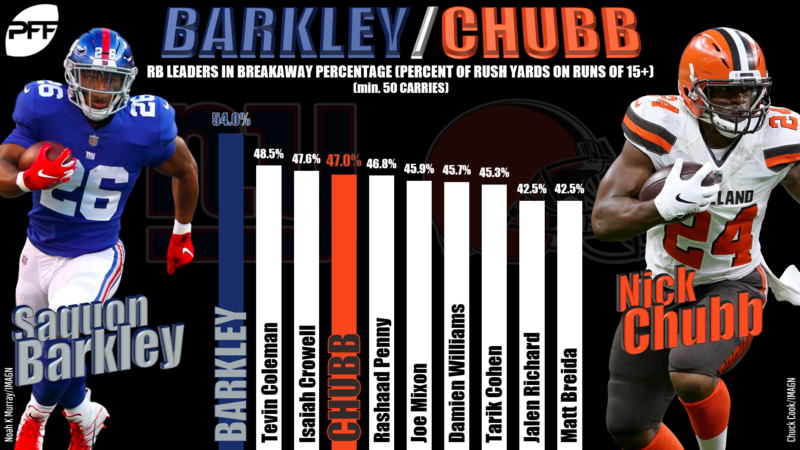 Chubb (47.0%), Joe Mixon (45.9), and Tarik Cohen (45.3) each also finished inside the top 10 in breakaway percentage on their ways to breakout fantasy campaigns. It’s worth taking a look at what other running backs fared well here as you might be able to identify some early sleepers for next season. For the first time since 2002 there were five running backs to finish with 330 or more PPR points as Barkley, McCaffrey, Todd Gurley, Kamara, and Elliott all eclipsed that mark in 2018. The average age of the top-30 fantasy running backs in 2018 was 23.9 years old, which is the youngest mark of the PFF era. Gurley was the top-scoring running back in non-PPR leagues for the second straight year. The last time a runner accomplished that feat three years was Marshall Faulk (1999-2001), who also wore a Rams uniform. Running back production has always been vital to fantasy success and this past season we saw most of the high-end running backs live up to their expectations. Eight of the top 12 running backs to go off the board in drafts this summer finished as top-12 fantasy running backs for the season. Bell was one of the four that didn’t, but his replacement (Conner) did. Investing in RB early and getting it right will set your team up for success, but don’t get complacent later in the draft and on the waiver wire as there is almost always some production to be found.